The Besom kids headphones for children off On-Ear Stereo Headphones give you a completely immersive sound experience with very crisp audio and booming bass, making you feel like you are right in the middle of a live show. Ideal for the everyday commuter, the headphones' lightweight and foldable design aid in portability, making them easy to store when not in use. Pillow- soft ear cushions sit snugly for comfortable use over extended periods of time. With a built in microphone and Pause/Play control pad, answer/end your calls and control your music directly from the headset! This is the perfect headset for anyone looking for premium sound and sleek style. Block out the annoying background noise and enjoy your daily commutes with the Besom Headphones! 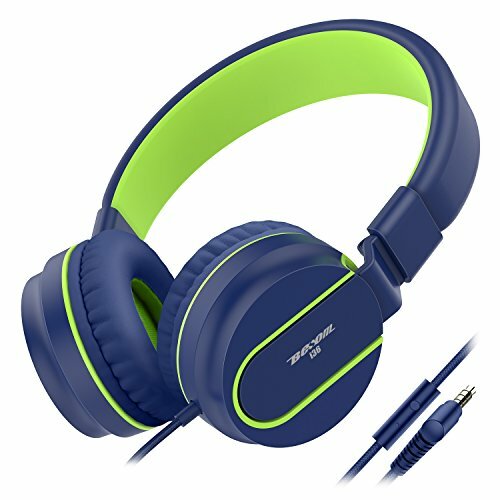 COMFORTABLE & STYLISH: Besom kids headphones for children offer premium comfort with pillow-soft ear cups. These dual colored headsets are bound to make sure you stand out in any crowd with a variety of stylish colors to choose from. LIGHTWEIGHT, FOLDABLE, AND ADJUSTABLE:Folding Design Make It Convenient to Carry.The Folding Part Have Been Tested for over 20000 Times.Design Make It Comfortable to Wear,Stereo bass headphone,Excellent Noise-cancelling Function. UNIVERSAL COMPATIBILITY: Built with a standard 3.5mm audio jack, Besom I36 is suitable for listening to music and watching videos! Works with Cellphones，computers, laptops, tablets, mp3/4 players and more. Perfect for iPhone, iPad,Kindle , Android, Blackberry, Mac, Pc. BESOM products come with 1 year warranty and 100% money back guarantee. If you have any questions about this product by Besom, contact us by completing and submitting the form below. If you are looking for a specif part number, please include it with your message.